Barcode Graphics Inc (BGI), Canada’s largest barcode services provider, also offers Nutrition Facts Table/Panel (Canadian NFTs, or U.S. NFPs) Labels. 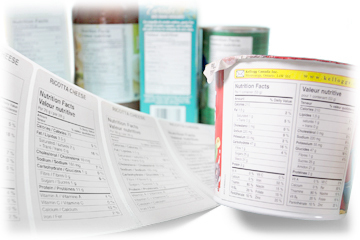 Manufacturers, consultants, designers, and pre-media operations can utilize this service to generate most of the Nutrition Facts label formats outlined in the Canadian Food and Drug Regulations, or in the U.S. CFR Title 21 and Title 9 regulations. NFTs/NFPs can also be used to address CFIA Corrective Action Reports that cite regulatory non-compliance (Canadian Food and Drug Regulations, Canadian Packaging and Labelling Regulations, etc), or to correct a label on packaging stopped at the Canada/U.S. border. Barcode Graphics can provide assistance with designing compliant labels, as well as doing limited, or comprehensive, Package Reviews. To complement our NFT/NFP service, BGI also offers ADS Analysis Service. Our ADS Reports are driven by customer supplied Adobe Illustrator package designs, or dielines, supplied to us via e-mail. These reports calculate ADS per government regulations/guidelines and provides a list of the NFT formats which are permitted on the package. The software also provides fit analysis to determine if a permitted format will fit in the package’s panels. This service is but one of many that Barcode Graphics’ offers related to Nutrition Facts labelling. Barcode Graphics also supplies EPS/PDF barcode masters, barcoded labels, barcode verifiers, scanners and consulting services. To get more information on these and other services provided by Barcode Graphics, contact us at 800-263-3669.